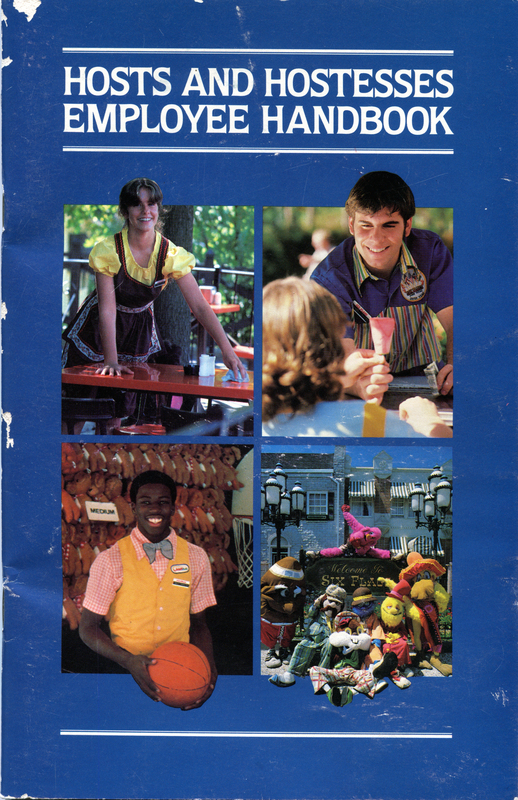 Cover of the 1981 Hosts and Hostesses Employee Handbook. The 1981 season was Magic Mountain's tenth year of operation and its third year under Six Flags ownership. The year would bring a major expansion to the park with the construction of Roaring Rapids and the Rapids Camp, which connected Cyclone Bay to Six Flags Plaza. Led by General Manager Dan Howells, the all-white male park management team used the 1981 Hosts and Hostesses Employee Handbook to remind staffers that "guests keep coming back ... because of you." When in costume, employees are "on stage" and they're being judged on their attitude. The 32-page handbook enumerates no fewer than 39 taboos, from drunkenness and profanity to violating the dress code. For men, it meant no beards (except as appropriate in Spillikin Corners), no hair beyond the shirt collar, no sideburns past the ear lobe, no moustache past the corner of the mouth or covering the upper lip  and absolutely no earnings. Women were to wear a bra and "nurse's type" shoes, and avoid "extremes" in dyeing or bleaching their hair. One quarter-inch stud was allowed in each ear lobe and nowhere else. Employees could expect free passes for family members (bypassing the $10.95 admission price, $5.95 for kids under 4 feet tall), and after meeting "certain requirements" they could take out a loan from the Magic Mountain Federal Employee's Credit Union. The full menus at the Oasis and Spillikin Corners were available at reduced prices for on-duty employees, who also got a 40 percent discount on merchandise. Employees worked in one of seven park divisions: Food and Beverage, Finance, Maintenance, Marketing, Merchandise, Operations (including ride operations, animal shows, admissions, wardrobe) and General Services (personnel, purchasing, First Aid, etc.). What is a 'Theme' Park? "Theme parks" are a certain style of amusement parks that have brought endless enjoyment to the American public. This style of park was created in the 1950s and prompted a massive revival of the amusement park industry. Up until then, parks had become somewhat tainted with a "carnival" atmosphere, and television had begun to draw more people during their leisure hours. It seemed amusement parks were on their way out. Then a creative man named Walt Disney happened upon a brand new way of "packaging" amusement for the public. Disney felt that if a pleasant environment was offered, properly equipped with rides and other interesting attractions designed for a full day's entertainment, parks could have an immense appeal. He also felt people would be more drawn to rides and attractions that revolved around a specific historical, cultural or geographical theme. That's the foundation of the "theme" park idea. Disneyland  the prototype theme park built around the Disney characters  opened in 1955 and was an immediate success. The next successful theme park to open was our Six Flags over Texas. The entire Six Flags operation continues to be a tremendous success because it refines and improves on the basic Disney concept that makes theme parks ever-appealing to the American public. The one-price ticket allowing unlimited access to all rides, shows and attractions within the parks was a Six Flags innovation. So was the introduction of professionally written, produced and fully staged Broadway-type musical variety shows as a park feature. While the modern American amusement park is a recent development, outdoor amusement centers have existed in Europe for more than 300 years. In America, the amusement park grew from rustic picnic groves where social organizations held their annual outings. In the early 1800s, Jone's Wood in New York City was the biggest and best-known amusement resort. It was eventually absorbed into the urban sprawl of Manhattan, and Coney Island was born as the first major amusement park in America. It started as a series of pavilions along the shore displaying vaudeville acts and games in the mid-1800s. Sports facilities were added in the 1890s, and amusement rides began to flourish as guests discovered the fun of being spun, twisted and dropped in a variety of thrill rides. The roller coaster and ferris wheel, among many other attractions, had their beginning at Coney Island. By 1919 the concept of amusement parks was so popular that over 1,500 existed in the United States. But they were very different from the sophisticated theme parks of today. Many were developed by trolley companies who placed the parks at the end of their line and used them as a means of stimulating travel. By the 1930s, with the growth of the auto, many trolley companies went out of business. Further, many of the original parks were located near major metropolitan areas, and as the cities grew, the park locations were taken over for other developments. As a result, at the end of the decade, parks had dropped to 500. These factors, plus the impact of World War II, continued to eliminate the smaller parks and by the end of the 1940s, only 200 parks were still around. Not until the 1960s did we see a revival, which brings us to the successful nationwide Six Flags operation of today. Finally, employees were told they'd take what they learned at Magic Mountain with them after their "formal employment" at the park was over. "The formula you learn for making our guests happy  smiles, cooperation, service, dedication, talent, patience and hard work  does not belong to Six Flags alone," the handbook states. "It's a formula that is the key to success of any business organization."